-- by one of our century's greatest mystics. For unhappiness, frustration, loneliness, and other afflictions of the spirit, Dr. Emmet Fox prescribes a powerful remedy based on the life and message of Jesus. In Alter Your Life, Fox explains that these "dreary" problems are actually bad habits of mind -- habits from which we can free ourselves. Through a series of brief meditations, Fox shows us how to exchange our bad habits of mind for the healthy ones demonstrated by Jesus. 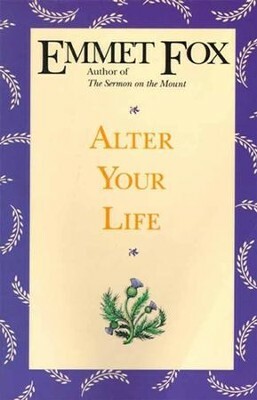 Based upon biblical texts, Alter Your Life offers a progressive, life-changing course designed for all readers, whether or not they have read a religious book before. Emmet Fox (1886-1951) was one of the most influential spiritual leaders of the twentieth century and a pioneer of the New Thought movement. His bold, dynamic message proclaiming that our thoughts shape our reality has changed the lives of millions across the world and influenced many key contemporary spiritual writers such as Wayne Dyer, Esther Hicks, and Louise Hay, all of whom have tapped into the power of positive thinking. Fox's other key works include Power Through Constructive Thinking and Alter Your Life. I'm the author/artist and I want to review Alter Your Life - eBook.